One of the most exclusive yachts available on the charter market, the Maltese Falcon is a floating masterpiece that turns heads wherever she goes. With all the qualities of a sailing yacht, including award-winning performance, she is as luxurious as a motoryacht with huge on board spaces – truly the best of both worlds. Delivered by Perini Navi in 2006, on her launch the Maltese Falcon redefined the world of yacht design. In a class of her own, she pairs an elegant design and black and silver superstructure with her revolutionary sailing system, the Falcon rig. The Maltese Falcon is able to welcome up to 12 guests, and carries a crew of 19 to look after her guests’ every need. Her interior, designed by Ken Freivoch is nothing less than spectacular. Modern and classy, the décor blends an industrial edge with a host of stunning materials complemented by a magnificent art collection. The Maltese Falcon has long proved a popular charter choice thanks to her endless amenities, experienced crew and world-class reputation. It is no surprise that she has received more than 18 awards since her launch. Expansive deck spaces are complemented by several different interior areas, including the six well-appointed guest cabins able to accommodate up to 12 guests. Located on the upper deck, the VIP cabin is particularly impressive and looks out on its own deck space. Perfect for sunbathing by day, the deck transforms into an outdoor cinema by night, with one of the biggest outdoor movie screens seen on any yacht. The deck also features an inviting Jacuzzi, perfectly located in front of the cinema screen – the best seats in the house! Her interior, designed by Ken Freivoch is nothing less than spectacular. Modern and classy, the décor blends an industrial edge with a host of stunning materials complemented by a magnificent art collection. The main deck features key entertainment areas with a full formal outdoor dining table and social circular bar that lead into the expansive main saloon. Forward on the main deck are a card and playroom area as well as a massive office with video conference facilities. The elegant interior formal dining room has a pared Japanese influence. A striking circular stairwell links all the main guest spaces with the main mast visible across all levels through the glass walkways. Innovation can be seen throughout the Maltese Falcon but nowhere more so than her ground-breaking Dynarig, developed by Dykstra Naval Architects. Her three carbon fiber masts rotate and feature computer driven sail deployment with fifteen sails. This advanced system means she is simple to sail, but above all, her design aims to achieve safety and stability in the water whilst achieving efficient and fast sailing. Her impressive performance under sail has seen her win several regattas, most notably in Porto Cervo, Sardinia in September 2018, where she collected an impressive 5 cups, winning on every race day, coming top of her class, and being the overall regatta winner. The Maltese Falcon has long proved a popular charter choice thanks to her endless amenities, experienced crew and world-class reputation. A near-endless list of water toys and tenders includes a 10m Pascoe tender, an 8.8m Scorpion tender, 4.3 Castoldi jet tender, Laser sailing dinghies, SeaBobs, flyboard, towables and so much more. Well suited to wellness lovers, she features gym equipment, a spa area and qualified masseuse. 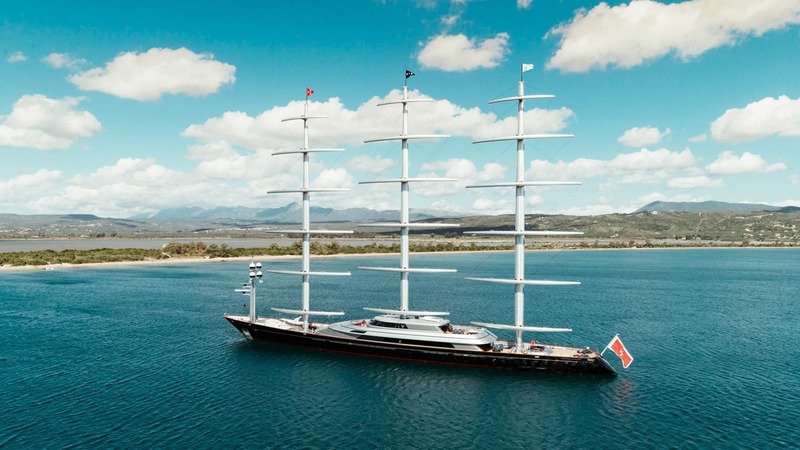 It is no surprise that the Maltese Falcon has received more than 18 awards since her launch, including being named ‘Finest Superyacht Ever’ by Superyacht World magazine. The most exclusive choice for a superyacht charter, she has no equal. To find out more about the Maltese Falcon’s impressive achievements and awards, as well as view more photos and audio-visual material visit the yacht’s official website. respond to your inquiry shortly.